Subtractor : Subtractor is the one which used to subtract two binary number(digit) and provides Difference and Borrow as a output.In digital electronics we have two types of subtractor. 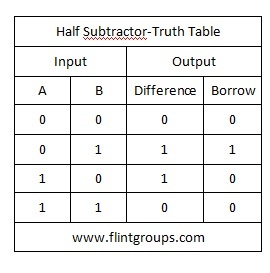 Half Subtractor :Half Subtractor is used for subtracting one single bit binary digit from another single bit binary digit.The truth table of Half Subtractor is shown below. Like Adders Here also we need to calculate the equation of Difference and Borrow for more details please read What is meant by Arithmetic Circuits? 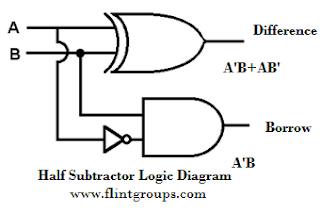 The logic Diagram of Half Subtractor is shown below. 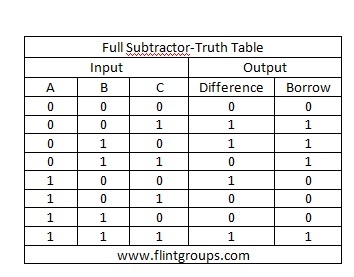 Full Subtractor : A logic Circuit Which is used for Subtracting Three Single bit Binary digit is known as Full Subtractor.The Truth Table of Full Subtractor is Shown Below. This was very neat and simple to understand. Thank you! Its not like u seen it in a different way. 0 - 1 1 is greater than 0 so we need a borrow to subtract 1 from 0 if u get the borrow then difference is 1 and borrow is 1. 1 - 1 difference is 0 and borrow is also 0 .
don't think as 0011 - 0101. I think you are clear now.till you are not clear don't hesitate to contact me. When I try to solve the difference in boolean simplification, i am always getting a value of 1, how youve come up the result of A+B+C with a circle on the operator? What is meant by Arithmetic Circuits?